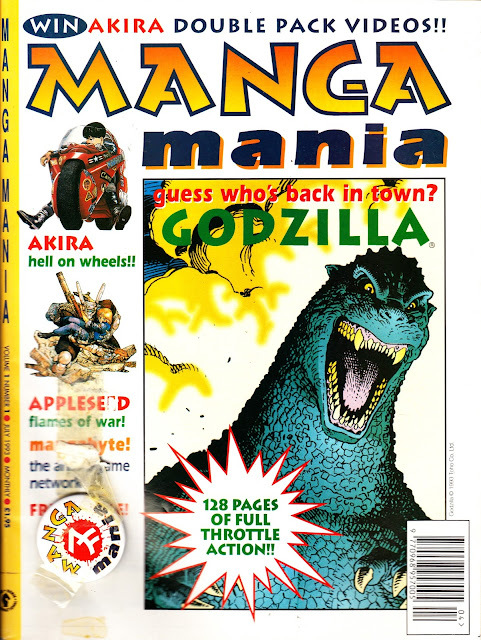 From July 1993: A hefty new launch from London-based Dark Horse International: The 128-page beast that was MANGA MANIA. There's something of an unplanned MARVEL UK reunion happening in this first outing. GODZILLA (albeit Marvel's controversy-attracting take on the city-stomper) had previously enjoyed a 1979 Marvel Revolution era run in MARVEL COMIC and, latterly, SPIDER-MAN whilst AKIRA (in colour, courtesy of Epic reprints) had graced the six-issue experiment that was MELTDOWN (1991-92). DHI, which burned bright briefly by following the tried-and-tested old British Bullpen formula of reprinting (mostly licensed) characters from the US line-up, didn't last long (the mid-decade slump forced Dark Horse to retrench back to the States) but MM itself soldiered on under two further owners: Manga (who probably saw it as a handy outlet to plug their own VHS offerings) and then Titan Magazines. I'm indebted to STARLOGGED reader "Jon T" who, back in 2013, posted the following excellent potted history of the title after I noted the first issue of Titan's eventually successor: 1998's MANGA MAX (see: here). I hope he doesn't mind me running it again here. In summary, Dark Horse UK wanted to capitalise on the rising crest of UK anime video releases in 1993 by putting a magazine together around manga strips they had the rights to (including nabbing Akira from Marvel). The following year Dark Horse closed their UK operation, at which point Manga Video got into publishing and continued the magazine themselves (around the same time they semi-controversially tried to copyright the word "Manga"). The magazine was much the same as before, and eventually even became squarebound, although noted writer Helen McCarthy was forced out due to friction with Manga Video. Real trouble on the horizon began towards the end of 1996 when the magazine finished their serialization of Akira in issue 37. The next issue saw the magazine branch into live-action Asian movies, which didn't go down too well with some readers at the time. Issue 39 was the last squarebound issue and the last one published by Manga, who shut down their publishing division shortly thereafter. Manga Mania was next picked up by third publisher Titan Books, with issue 40 appearing three months later, although issue 41 would appear a staggering five months after that. The last few issues appeared some two-three months apart until issue 46 in mid-1998, which was the final issue. A second volume of Manga Mania with a more international bent was promised, but ultimately appeared as Manga Max, apparently due to a trademark issue in the U.S. Although Manga Max stuck back to a monthly schedule, it had a much smaller page count and, in their effort to appeal to U.S. readers, often annoyingly featured reviews of anime video releases that would never see the light of day in the U.K. Ultimately, the effort to appeal to the U.S. is what finally killed it, as Titan was shipping copies out to the U.S. by sea. Consequently, by the time it hit the stands over there, most of the breaking news featured within was wildly out of date. Manga Max's final issue was #20 in mid-2000. Another comeback was promised, but never materialized. congrats slow on passing your 300th post this year.